Jubilee. Photo & text: David Secombe. Posted: June 5, 2012 | Author: thelondoncolumn | Filed under: Anniversaries, Ceremonial, London on film | Tags: Andrew Festing, Edward Mirzoeff, Helen Mirren, Jubilee, Queen Elizabeth II, Stephen Frears, The Queen |Comments Off on Jubilee. Photo & text: David Secombe. Buckingham Palace, 1991. Photo © David Secombe. 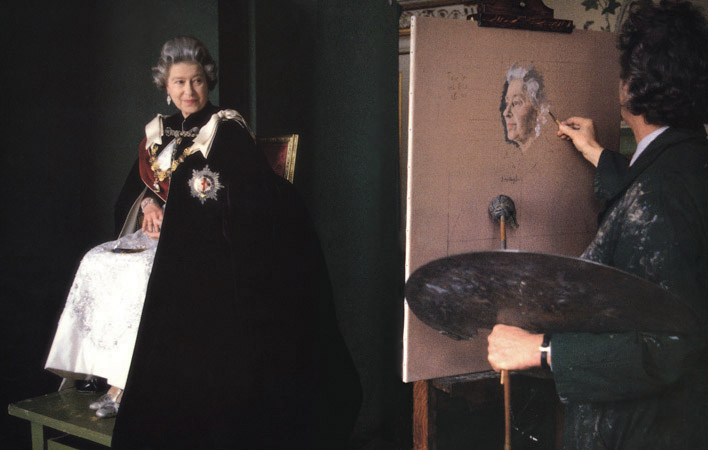 Stephen Frears film The Queen, featuring Helen Mirren’s acclaimed turn as Her Majesty, opens with a sequence in which the Queen has her portrait painted. The look of the sequence betrays the research the production team invested in Eddie’s film, and some of the details are lifted from the above picture (when the image first appeared, I remember being asked a lot of questions about the Queen’s silver shoes – this obviously made an impression on Frears’ team). I have heard that Stephen Frears denies ever seeing Eddie’s film. How sweet. … for The London Column. © David Secombe 2012.